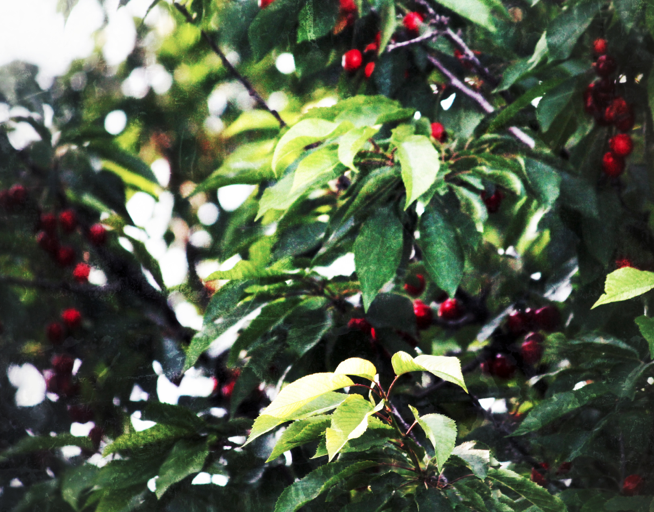 hightouchmegastore: The Megastore recommends (garden edition). Of late, I have fallen upon my (perhaps neglected in recent years) garden like the person of a long-lost beloved. Perhaps you've noticed this. Anyway, should you also have a garden that you have neglected, these recommendations may be helpful. And I always want to be helpful (perhaps you've noticed this?). 1. Something you've never tried before. Almost everyone has a handful of tried and true flowers or vegetables, and tried and true flowers/vegetables have many virtues, i.e., that they are reliable and dependable (ergo: tried and true). For me, the tried and trues are basil of all sorts, rosemary, single flowered marigolds (do not foist your giant pom pon marigolds upon me! ), nicotiana, lemon verbena. Stocks if I can get them (this year I was too late). Cosmos in all their glory. All these I have in my garden this year. 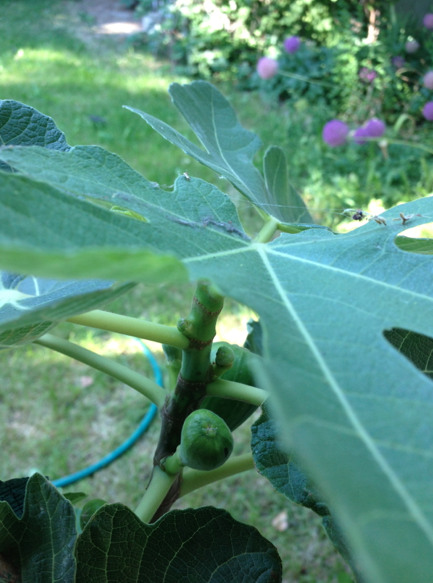 I also bought the previously mentioned fig tree, and I am feeling super optimistic about it, optimistic for no good reason, of course, but hopeful nonetheless. I will keep you posted about the figgery. I also planted delphiniums this year. I had delphiniums once in a glorious garden in which everything grew like it had nothing better to do--but that was decades ago. But I already have one plant in bloom, and another preparing to flower, so the delphiniums are also giving me a happy thought. 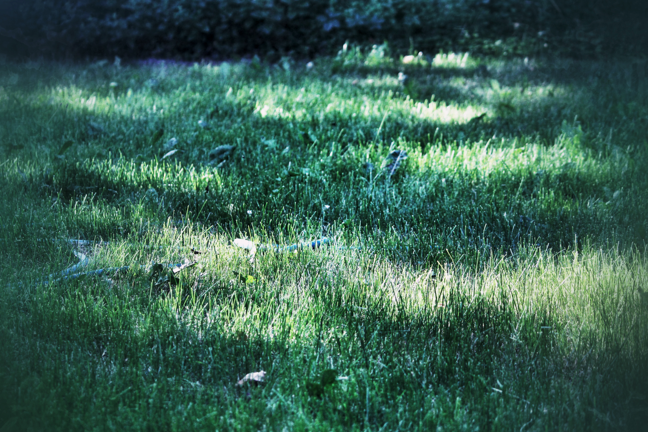 light on the grass, which varies with the breeze. 2. A little time in the garden, every morning. I am generally not a morning person. Our international travels, however, have reset my clock just a little, so that I can, and what's more want to, get out of bed when the alarm goes off at seven. I take early-ish walks, break my fast, and of late, go into the out of doors in order to see what's going on, do a little this and that, pull up a morning glory, smell a rose, pinch back the flowers on the basil. That sort of thing. I am particularly loving the bright red chaises I bought the other day--I take my breakfast out there and look at the light and listen to the birds and feel pretty happy with everything. If you don't have a little chair or something in your garden, pull one from your house or--better idea--buy a bright red chaise. Spend a few minutes. It's good for you. Moreover, as my best friend recently told me, bird song helps to reduce stress (there's a study! with science in it!) --so, you know, go listen to some birds in your garden. It's good for you (i.e., "science"!). 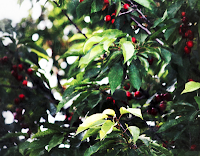 I believe that the birds will not eat all the cherries, for instance. 3. Optimism. I think that gardening requires this. People who are good at gardening bring more than optimism to the table--there's are little things like "watering" and "weeding" that can't be neglected, for instance--but you have to believe that you can make things grow, that the seedling you're putting in the ground will get bigger, set flowers, fulfill its destiny. I can feel already how being outside and working, even a little, on making things beautiful and helping things grow is making me more hopeful about a lot of things. Happier. More content. this, times about twenty. it's gorgeous. 4. Let stuff run riot. I am particularly happy with the rampant swaths of blue flax and centaurea we have happening in our front yard. 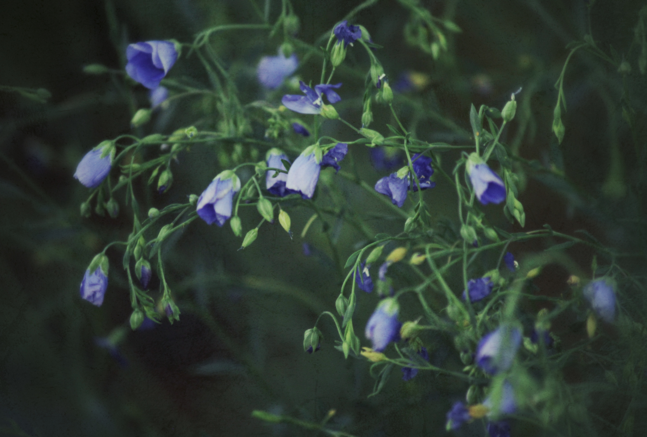 They are (a) blue, and (b) abundant--when they're blooming, there is lots and lots of flowering, like a haze of blue. I find this intoxicating. I wish for this excess with every single flower I plant.